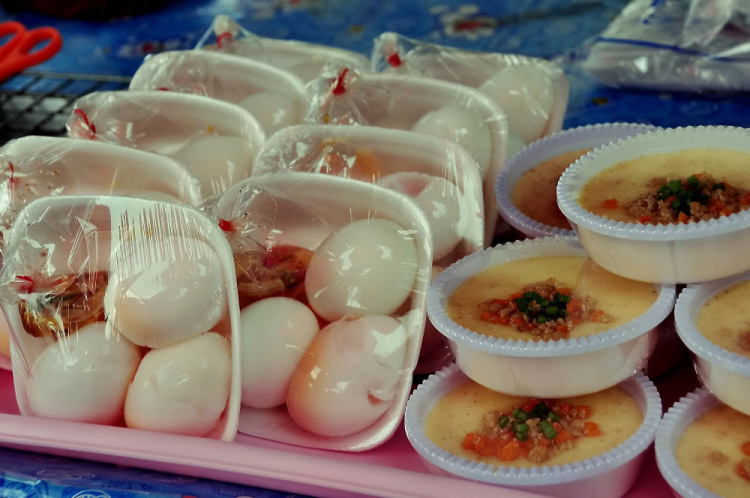 Eggs in Thailand - pink, black, millennial - how to choose those eggs. 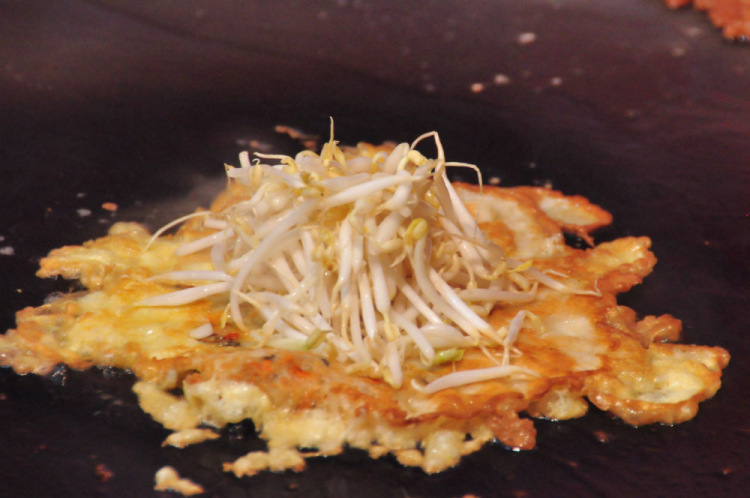 Here's an example of an omelette with mussels and soy sprouts - fast to cook and sooo tasty. 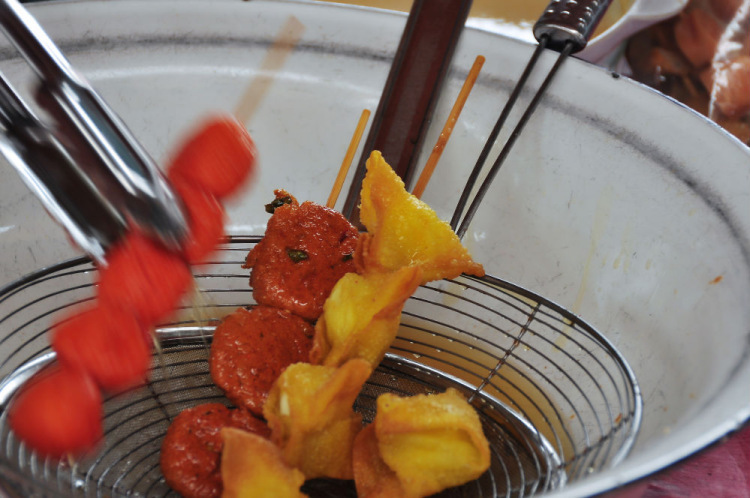 Also for a quick snack they boil quail eggs cleaned from the shell, wrapped in dough and put on skewers and then fried in oil. They are on the photo above, the little yellow ones. 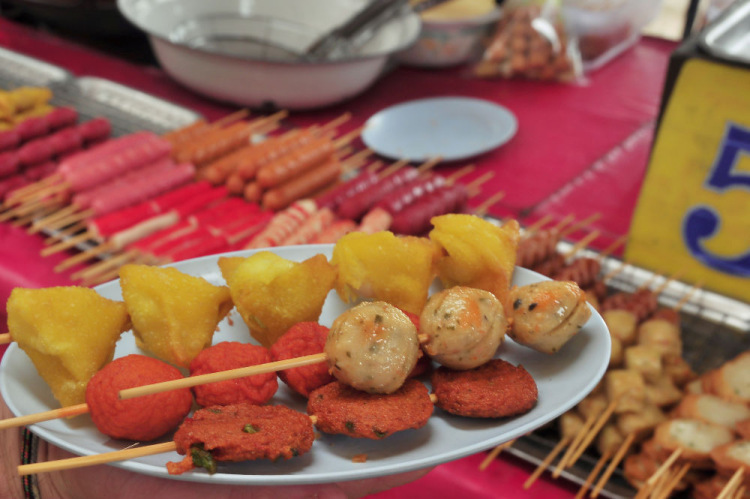 These all are five baht. Sometimes they are strung on skewers like kebabs. 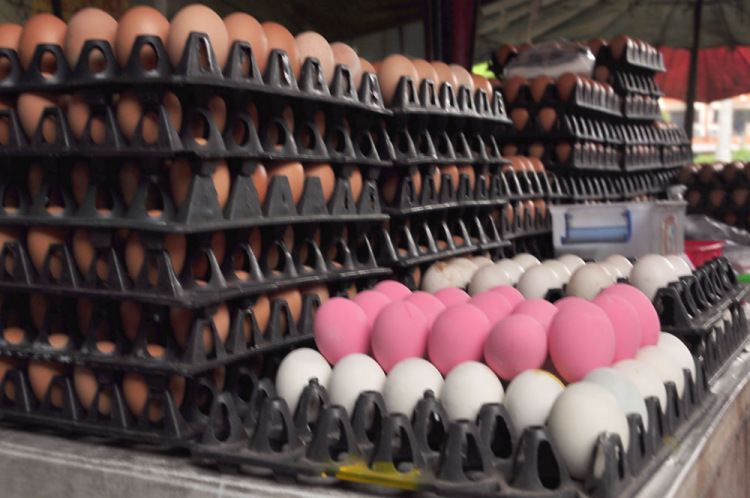 Eggs are sold in several different ways, not only raw, but ready-cooked, or pickled, especially be careful when buying on the market, ask what you are buying. 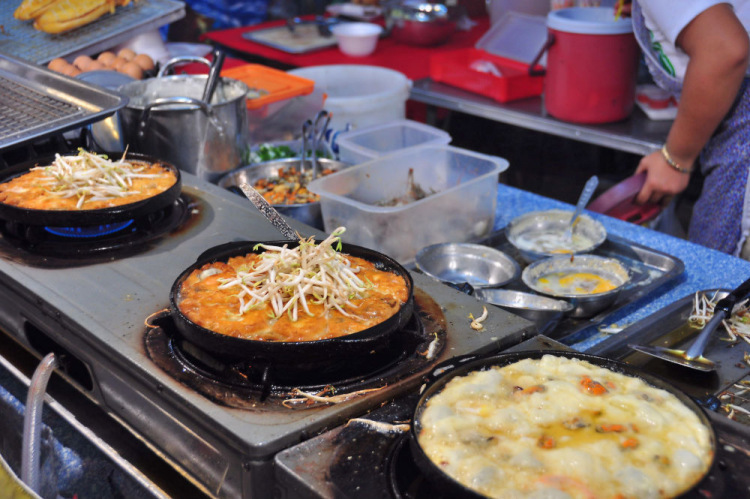 There are lots of choices of egg dishes, of course I will not list all of them. Eggs can also be marinated. Here is the example - rosy and greenback ones. No it's not Easter coloring, and it was not colored for the kids. Those are real black eggs! They are black inside. A Black-black hen sitting in a black-black room and laying black-black egs - (This is a joke of course). They are called age-old or millennial. It came here, like many other dishes, from China. Of course, a long time ago people did not have refrigerators (nowadays here in Asia not everyone has it in the villages), and it was necessary somehow to store products. 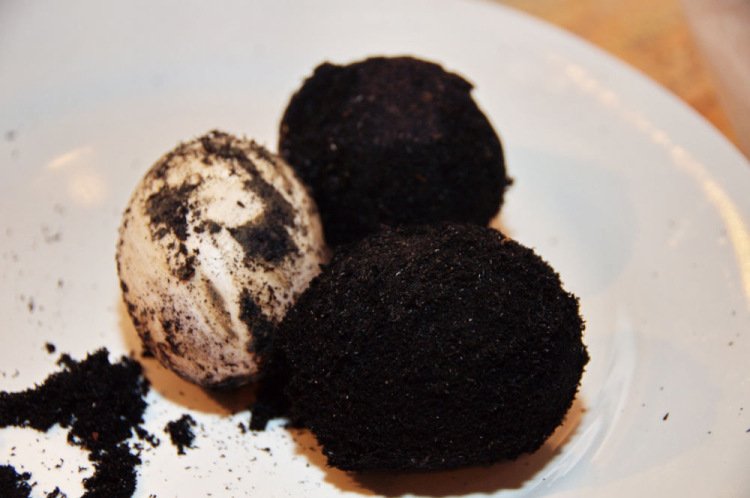 The traditional way was to store eggs in a mixture of tea, wood ash, lime, salt and rice pulp. 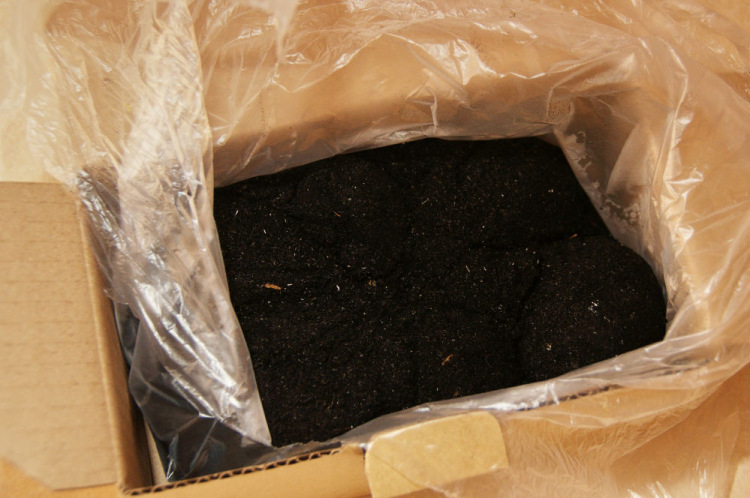 Coated in that mixture, they were kept for several months until the mixture dried up and turned into a hard crust, then it was ready and could be stored even up to 3 years. 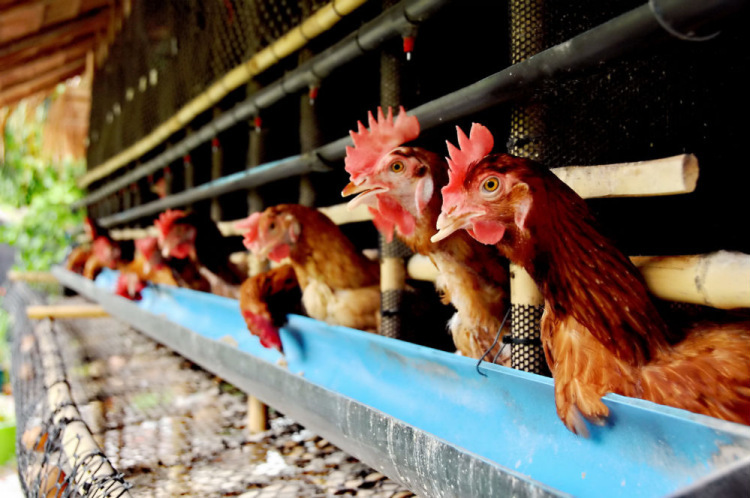 The modern way of course is much simpler - the eggs are kept in a brine of salt and calcium carbonate solution for 10 days, but they can not be stored for too long. Traditionally duck eggs were used, but chicken eggs can do also. By the way, the study of the product has led to some very mixed results, on the one hand it is not very healthy because of the high content of zinc oxide, on the other hand, there are studies conducted in the field of pharmaceuticals on the protein altered in such a way. 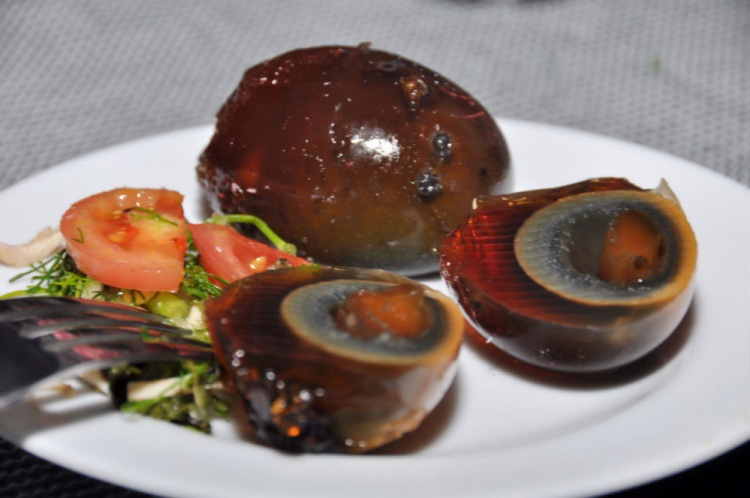 However, those egs are considered a delicacy and served as a snack or by cutting into slices with sauce (mixture of soy sauce and vinegar), or cut into pieces and added to a big variety of dishes - from soups to rice porridge. 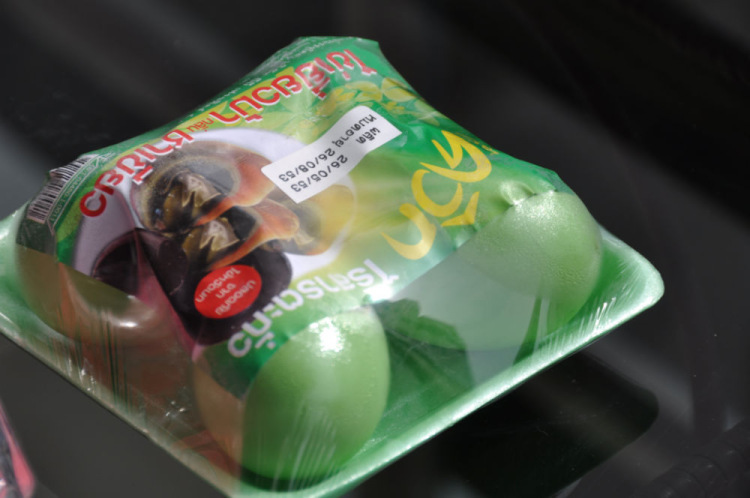 Preserved eggs are stored in the refrigerator for several months. 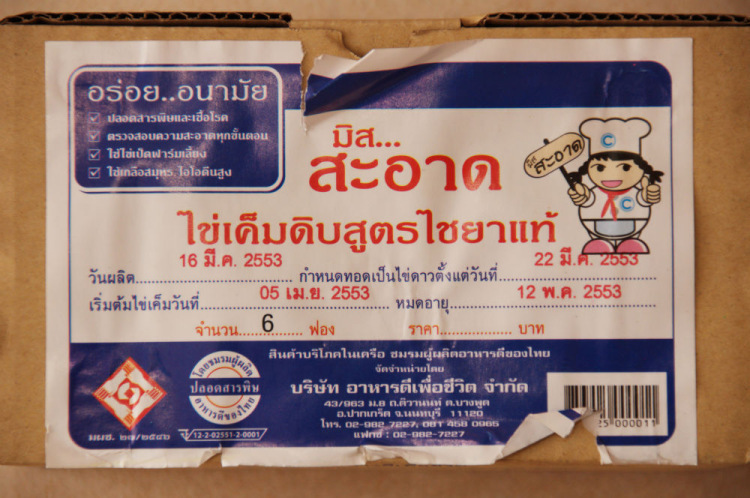 The taste is unusual, I do not know what to compare it with, the smell is slightly of ammonia and it is rather tasty. Might be a good addition to a salad. You should try it at least once in your life, you won’t get poisoned and if you don’t like it, just do not eat it, those eggs are sold in packs of 2-4. 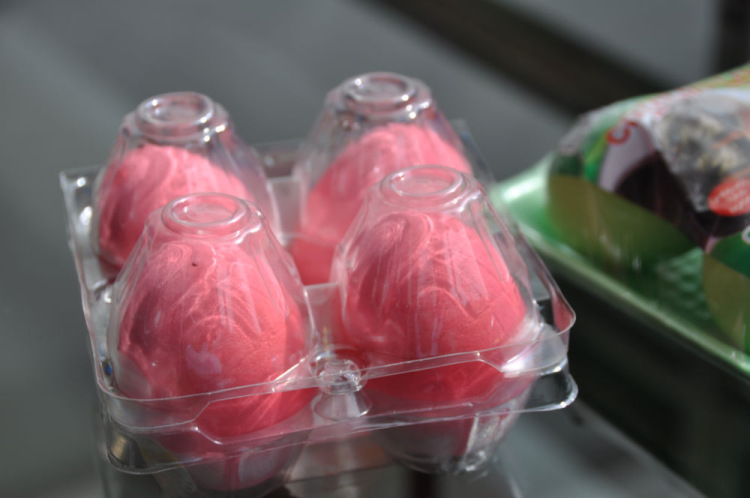 Here in Thailand you may find eggs painted in pink or green and for example in the Philippines they are sold brightly red. 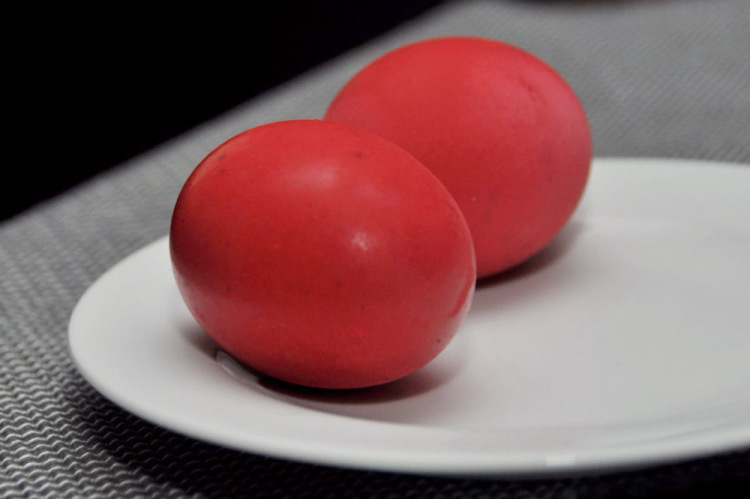 Filipino eggs "Balut" have similar coloring (outside) - pink or purple. Ooh, that's a terrible thing! 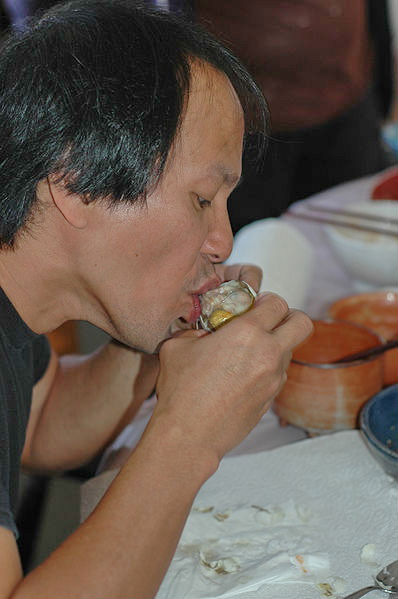 Balut is a signature dish of Filipinos. 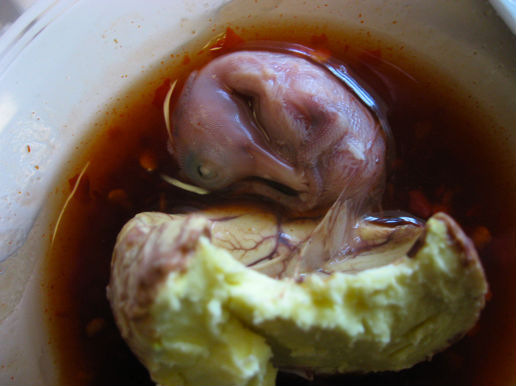 Inside there is an almost hatched embryo duck. 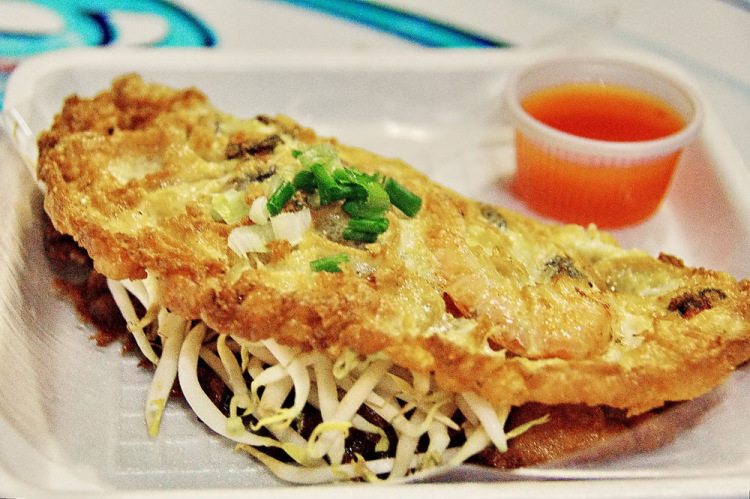 This dish is known outside the Philippines in the neighboring countries of East Asia, in Thailand and Laos, for example, it is called Khai Luk and is considered aphrodisiac. 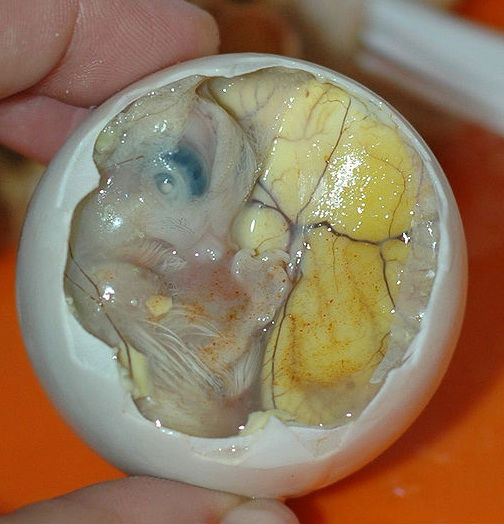 Balut is most often eaten with a pinch of salt, lemon juice, pepper and coriander, though some balut-eaters prefer it with chili and vinegar. You are supposed to eat the whole content of the egg, although there may remain some inedible parts, depending on the age of the fertilized egg. 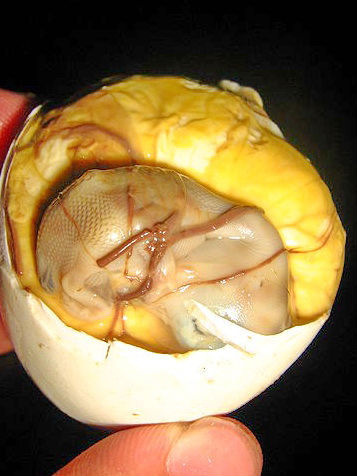 In Philippines, Balut has recently started being served at the restaurant as a haute cuisine - "Adobo" style, fried in omelettes or even used as filler when baking pies. Here's a version of the egg conservation. 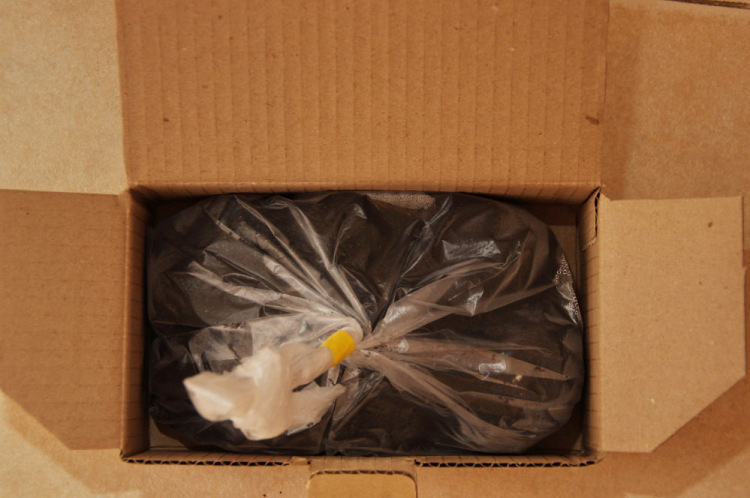 These are sold in clay and ashes, carefully packed in a box. Inside, there are such a "fur balls"
These are salted eggs, a method of cooking is very similar to the one described above - eggs are soaked in a salty brine. Then, these eggs can be boiled, or added to soup. 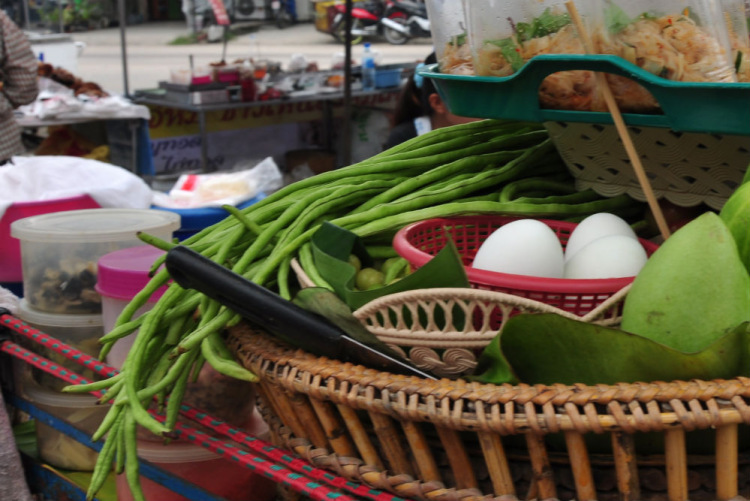 Usually, they are served as a condiment for fresh rice porridge. 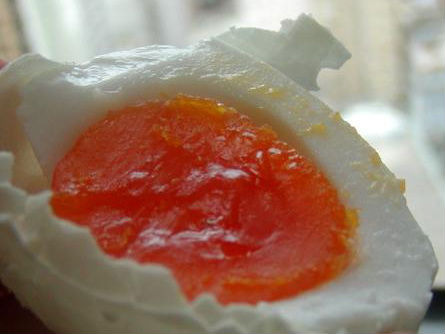 The taste is very salty, egg yolk is bright orange, sometimes almost red in color. 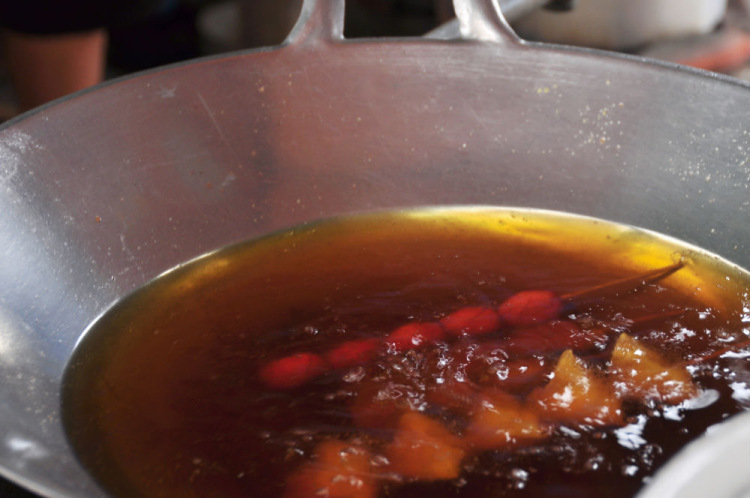 They are generally quite often used in cooking, in here the flavors can be a lot different from those we got used to, for example food can be sweet and salty at the same time, or even have more than four flavors in the same dish. Can be eaten right away or added to soups. More recently I found such a sandwich-salad option in internet . But I have not yet found it in a store. By the way do you know that there is a "World Egg's Day"? In 1996, in the city of Vienna there was held a conference of the “International Egg Commission”. 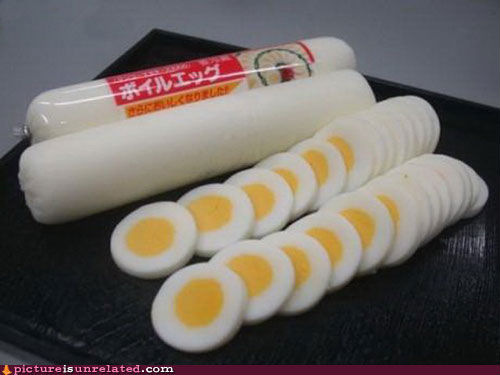 Delegates felt there was a need to create for the egg and its derivatives to have their own culinary feast. Then a certain day was chosen for this holiday - 2nd Friday of October. 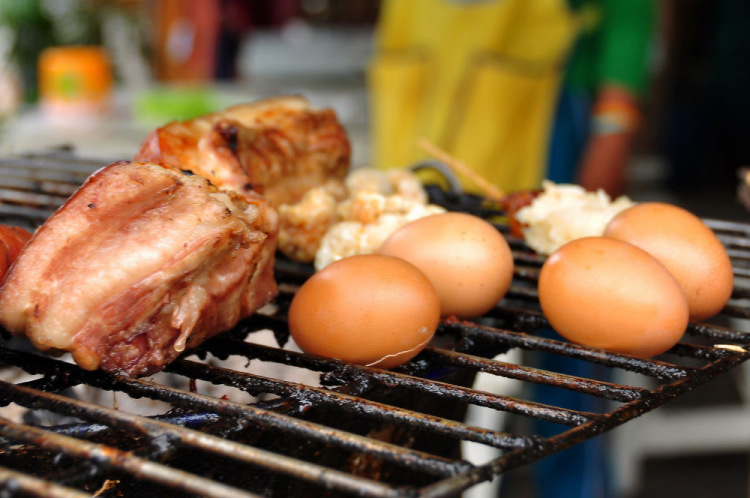 If you have any information or concerns about the subject, (and you're sure about this, and not just heard it somewhere), it would be great if you could add it in the comments , well, maybe even share your pictures of "egg-cooking" in Thailand and neighboring countries.